Feb. 25, 2018: National flags are projected on the stands as athletes enter the stadium during the closing ceremony of the Pyeongchang 2018 Winter Olympic Games. With fireworks, K-pop and fanfare, the 2018 Winter Games wrapped up in Pyeongchang, South Korea, at Sunday’s closing ceremony. 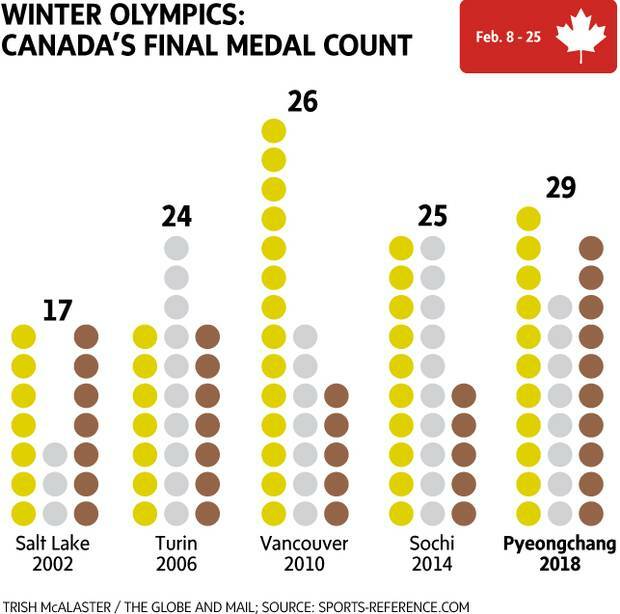 Canadians are leaving Pyeongchang with 29 medals, a national record for the Winter Games. Canadian athletes won 11 gold, eight silver and 10 bronze. Three of those medals were from speed skater Kim Boutin, who carried Canada’s flag at Sunday’s ceremony. Olympic athletes from Russia, celebrating a gold medal in men’s hockey after beating Germany 4-3, didn’t get to carry their national flag: The International Olympic Committee decided not to lift Russia’s suspension over doping at the 2014 Games. The IOC said two Russian doping violations in Pyeongchang marred an otherwise clean report card for the country’s delegation. While South Korea’s President Moon Jae-in and Ivanka Trump watched the ceremony from a box above, the North signalled it might be open to talks with the United States. South Korea’s presidential office released a brief statement saying Pyongyang has “ample intentions of holding talks” with Washington. Sunday’s ceremony was also the official handover to China, which plays host to the 2022 Winter Games in Beijing. The Summer Games are in Tokyo in 2020. Pyeongchang will also be home to the 2018 Winter Paralympics from March 8-18. Sunday's closing ceremony was a colourful spectacle showcasing K-pop, including singer CL and boy band EXO. At the official handover to Beijing, which will play host to the 2022 Winter Games, performers in lit-up panda costumes danced on stage. South Korean President Moon Jae-in watched the proceedings from the same box as top North Korean official Kim Yong-chol and U.S. President Donald Trump's daughter, Ivanka. Mr. Kim's presence was contentious for some South Koreans: The vice-chairman of the ruling Workers' Party's Central Committee is widely blamed for the 2010 sinking of a South Korean navy ship that killed 46 sailors. Even as dancers told cultural stories to music before a huge crowd, South Korea's presidential office released a brief statement saying that Pyongyang had expressed willingness to hold talks with Washington. Only hours earlier, the official KCNA news agency warned that President Donald Trump's administration had "brought the threat of war to the Korean peninsula" with talk of new sanctions on Friday. A juggernaut squad of Olympic Athletes from Russia beat a German upstart 4-3 in overtime to win the men's gold medal hockey game. Kirill Kaprizov scored the game-winner as 'Team Olympic Athlete From Russia' came back to beat underdog Germany 4-3 in overtime Sunday. The Russians, playing under the Olympic flag, boasted a lineup featuring former NHL superstars Pavel Datsyuk and Ilya Kovalchuk. The Germans, largely written off before the tournament began had upset Sweden in the quarterfinals then shocked Canada 4-1 in the semis to reach the gold-medal game. Ice dance champion Tessa Virtue and Scott Moir paid tribute to the late Tragically Hip frontman Gord Downie in Sunday's figure skating exhibition. The couple skated to the Hip track Long Time Running. Moir calls Downie, who died last year of brain cancer, "one of my heroes and a guy who was so wonderfully weird." The gala is a curtain-closing tradition in figure skating with medal winners performing exhibition programs. It's all show and no competition. Sweden beat South Korea 8-3 to claim their third women's curling gold medal in four Winter Games on Sunday, ending the "Garlic Girls" fairytale Olympic run that captivated the home nation. While Sweden confirmed their status as the dominant force in women's curling, Korea's silver marked a major Asian breakthrough in the sport with two teams on the podium after Japan defeated Britain on Saturday to take the bronze. The only previous Asian team to win an Olympic medal were China's women, who won bronze at the 2010 Vancouver Games. Canada failed to make the podium in four-man bobsleigh despite having three sleds in the competition. Justin Kripps of Summerland, B.C., who won gold in the two-man event earlier in the Games, placed 6th while the sleds piloted by and Nick Poloniato of Hamilton, Ont. and Chris Spring of Priddis, Alta., came in 12th and 16th respectively. Germany's Francesco Friedrich crew won gold while South Korea's Won Yunjong and Germany's Nico Walther tied for silver. From the opening ceremonies to Patrick Chan’s big finale to Virtue and Moir’s golden moment, here are some of the highlights of the 2018 Winter Olympics.